Catherynne Valente and that fabulous girl in fairyland. The covers alone of these two books are enough to make you want to pick them up and hold them close. They really are delightfully presented and will be added to my pile to be reserved from the library. Thanks to Macmillan Kids for these links. The Traitors by Tom Becker. Great cover for a start. A story of betrayal and survival. Adam is in the Dial, a notorious prison in notime. It is an awful place where teenagers are sent to atone for their crimes. Only one person has ever escaped although no one knows if the escapee survived. If Adam is to escape and find his way back in to the real world he needs to trust someone but is there anyone in such a desperate place filled with criminals? Farewell to the great Margaret Mahy. Thoughts and prayers are with you and your family. It is very sad news indeed that New Zealand and the rest of the world has lost one of the greatest children’s book writers. Margaret died yesterday after a short illness and we will miss her creativity always. I know from meeting and working with her on many occasions how inspirational she was. 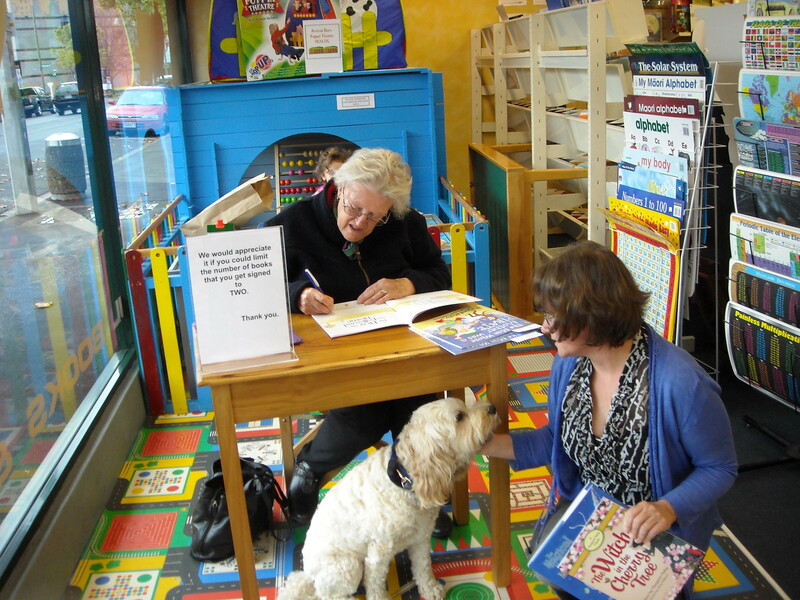 She always made time for everyone and spent ages signing books, always adding a little drawing or two. The photo here is the last one taken at the Children’s Bookshop in Christchurch shorlty before it was destroyed in the earthquakes. She is signing books for the kids at the school I work in during the week and it is a photo I treasure. . In our house, our favourite book was The man whose mother was a pirate but there have been so many others. To hear her recite word perfect, Bubble Trouble was truly amazing. Farewell Margaret and rest in peace. Thank you for all your stories and inspiration. The killables by Gemma Malley. Evil must be eradicated but who decides? Evil has been eradicated and a new City has been established. Citizens are only permitted to enter after having the ‘evil’ part of their brain removed. According to how ‘good’ they are, as judged by The System, people who show any sign of emerging evil are labelled K’s. But who knows what that means? The only sure thing is that people labelled K’s disappear and are never seen again. This futuristic novel is on my list. Very intriguing and the reviews so far make this a must read. Gene is 17 and different from those around him. His dark secret is that he is human in a world where humans have been eaten almost to extinction. Gene is chosen to participate in the government-sponsored hunt for remaining humans but how can he elude his fellow hunters who are beginning to suspect there is more to him than what they see. I love the book cover of this book – the New Zealand one is pretty cool. Definitely looking forward to reading this one. Frost leaves her homeland to travel to the neighbouring country of Ruan where she hopes to find a deity who can rid her of a powerful and dangerous curse. It is a curse which creates havoc, turning berserker rage in the form of a wolf which overtakes her and kills everyone within reach at the site of her own blood. Journey with Frost and the people she meets, the people who can help and the dangers she must face. Not out in New Zealand yet but I will be watching out for this one when it does. For all those boys who love the snotty, smelly and funny Dinoaur Rescue books I guarantee you will love these two book trailers. I love watching the children roaring with laughter in the library when they watch these. But I love even more the fact that they want to borrow the books as well. Great for 6,7,8 and nine year olds who just want a good laugh. Wintercraft is an ancient magical book which is thought to be hidden deep beneath the graveyard city of Fume. The knowledge within it holds the key to Kate’s survival and those she loves. But others want the book and will stop at nothing to get it. Kate is one of the Skilled who possess a very rare ability to see through the veil between the living and the dead. Her ability puts her at risk from the High Council who have their own sinister plans for Kate and the book. There is danger and mystery everywhere Kate turns but she must fight on or face tragic consequences. In Legacy, the third book in the trilogy, just recently released, the veil marking the division between life and death is falling and lost souls are roaming the graveyard city of Fume. Kate’s only hope is to return to the dark secrets in Wintercraft (the book of her ancestors) and learn from their mistakes in order to find peace and ensure her survival. In the U.N.A. (the super-country that was once Mexico, the U.S., and Canada), Alenna fails a test that all sixteen-year-olds must take. The test reveals that she has the potential to be brutally violent. Alenna is then sent to The Wheel, an island where all would-be criminals end up. Survival is likely to be short-lived if not impossible on The Wheel. There are land wars and dangerous child-snatching machines to deal with. In desperation Alenna and a group of other prisoners decide to escape the island. Escaping may be impossible, but it may be their only hope for survival. This is definitely another to add to my pile of books to be read. The trailer is also very cool. Watch out for this one due out this month especially if you enjoy a good solid dystopian novel. Thanks to Lisa Stasse for the links. This is definitely one just for good old fashioned fun. Light hearted and funny. decides to not give his daughter access to her $25 million trust fund on her 18th birthday. In order to get it back Lexi has to complete 52 menial jobs, one each week for a year. She has to report daily to her father’s college-age intern, Luke (who is of course, young and hot) Her tasks include cleaning houses, bagging groceries and other menial jobs. Will she or won’t she grow up and gain her father’s trust – as well as his trust fund. This is one for everyone who wants a break from vampires, dystopia and just wants a good read for fun. The trailer could very well pass as a movie trailer for a young adult chick flick.